Megahertz upsampling algorithm up-samples all PCM music to 1.5MHz in 32bit; Femto Master Clock provides an ultimate clock precision with jitter only 82 femtoseconds (0.082 picosecond).... VEGA supports all high resolution music formats including DXD (352.8KS/s, 384KS/s in 32bit) as well as DSD stream at 2.8224MHz and 5.6448MHz. Five digital inputs include AES/EBU, coaxial (set of two), toslink and USB. The balanced and single-ended analog outputs can connect to power amplifier directly, adjusting volume in digital precision without dynamic loss. Other interesting bits place the THD+N at an eye-poppingly low <0.0003%, with a dynamic range at 130dB. And about that "DAC-direct" thing -- the output impedance, via the balanced outs, is 4.7ohms. That's four-point-seven (it pops up to a 50 for the single-ended outputs) -- and yes, that's very good. Volume control is entirely digital. 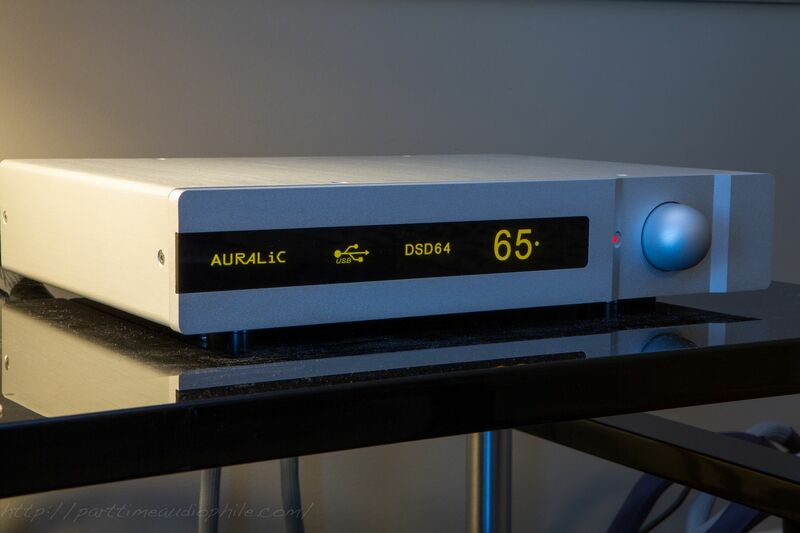 This DAC was pretty much the poster child for “what’s new” in digital audio these days — absolutely incredible specs, paired with DSD support. And such a pretty little package! I’m not sure what to make of these “low” prices, but it’s a pleasantly far cry from the $20,000 average Art Dudley decried. Things are changing so fast in this space, I can only wonder where we’ll be in a year’s time, much less five. Egads. Also on display were the Auralic Merak amplifiers and the Taurus preamp driving a pair of Vienna Acoustics Beethoven Grand loudspeakers. An Oppo BDP-105 was used as a transport. Where do people get this idea (planted probably by Wadia long ago) that the “digital domain volume” is benign and analog is not, while it is the contrary IMHO.